First, they infiltrated this kinda-creepy Chinese hotel. Now, they're taking over Hong Kong. When will the fake panda madness end? As part of a world tour by the World Wide Fund for Nature (WWF) to generate support for protecting the endangered species, a charter flight full of 1,600 papier mâché pandas landed in Hong Kong International Airport this week. How much papier mâché bamboo they consumed while on board, however, remains unknown. 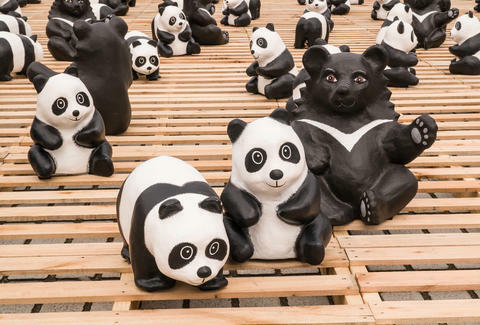 Designed by French artist/panda enthusiast Paulo Grangeon, the faux bears arrived in China after visits to France, the Netherlands, and Germany, among other stops in Europe and Asia. According the Telegraph, the number of paper pandas reflects the amount of real ones that were believed to exist in 2004, as estimated by the WWF. After getting bored at the airport, the pandas ventured into the city and are checking out the sights until June 25, hitting landmarks like the Shatin racetrack and Victoria Harbor in an effort to spread cuteness and raise awareness about their plight.